Never lose the fooler again! 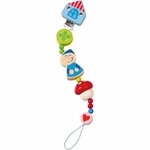 Clip the pacifier chain to baby's cloths. Made of beech wood. Measures 8" long.